WASHINGTON — When President Trump nominated Scott Gottlieb as the head of the Food and Drug Administration, he was quickly pegged by many as a conservative businessman who was cozy with the pharmaceutical industry. Seven months later, he is attracting praise from some of President Trump’s staunchest critics — including former Obama administration officials. He may also be in line to succeed his old boss, Tom Price, as secretary of health and human services. “I think he’s been a real bright spot in the administration,” said Andy Slavitt, who headed the Centers for Medicare and Medicaid Service for two years under President Obama and who has been a harsh critic of the Trump administration. 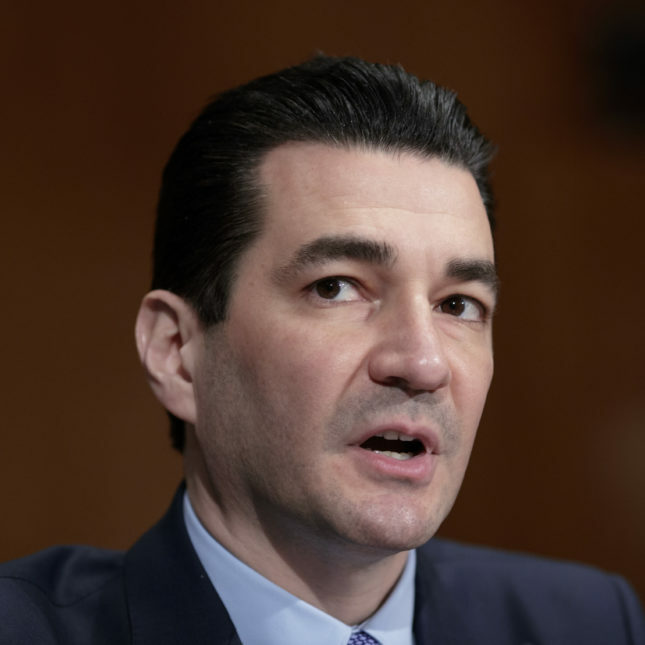 That Gottlieb is seen as a front-runner to succeed Price — following the latter’s abrupt resignation late last week — may be a credit to his approach at the FDA. He has moved quickly on a variety of fronts, seeking to widen access to generic drugs, asserting that the agency should play a role in addressing the nation’s opioid epidemic, and announcing plans to tighten regulations on tobacco products. The question is whether Gottlieb’s early successes at the FDA — and his technocratic style — could translate to the larger stage of the Department of Health and Human Services. While Gottlieb has won bipartisan praise, he has only just begun to outline how the agency can do everything on his agenda, from bringing down drug prices to accelerating drug approvals without compromising safety. And although he has been a vocal critic of Obamacare — blasting the law in op-ed columns for diminishing competition among insurers, or for discouraging independent physicians from remaining independent — it’s unclear how he would respond to pointed questions about the Affordable Care Act in the aftermath of Republicans’ failed repeal effort. An FDA spokesperson declined to comment on whether Gottlieb is under consideration for the job and declined to characterize his relationship with Trump, referring questions to the White House. In response to questions about Gottlieb and other contenders, the White House said there were no personnel announcements at this time. CMS Administrator Seema Verma, another of Price’s deputies, is also considered a front-runner for the HHS job. The Trump administration leaned heavily on Verma to make its pitch for Obamacare repeal in both the House and Senate, raising her profile among the lawmakers who will oversee the looming confirmation fight. Gottlieb, by contrast, has long been a fixture in health policy circles in Washington. Before taking the helm at the FDA, from 2003 through 2007, he worked at the FDA and at CMS, then spent about a decade in the private sector at companies and think tanks. When he was nominated as commissioner, he was a resident fellow at the American Enterprise Institute — and served in leadership positions in health investment companies. He is also a medical doctor. “He’s an expert not only in the areas of FDA regulatory matters, but also in just knowing how to work effectively at the FDA,” said Dr. Mark McClellan, who served as FDA commissioner under President Bush from 2002 to 2004. Gottlieb worked for McClellan as senior adviser. Agency watchers say Gottlieb is getting a lot done — and, perhaps just as importantly, he’s been effective at making sure everyone knows just how much he’s getting done. Instead of merely issuing notices in the Federal Register about FDA plans, Gottlieb has proven far more media-savvy, taking to making policy pronouncements with concurrent press releases, speeches, blog posts, and the occasional academic journal article. He routinely speaks at conferences and engages directly with journalists on Twitter. He has also shown a lighter side, bantering with reporters about his choice of skinny jeans for a farm tour and slipping in a reference to his family’s egg-laying hens in an otherwise businesslike speech about food safety. A former FDA official stressed the importance of messaging at the FDA — to communicate the ways in which an agency is using sometimes complex regulatory schemes to ensure U.S. food and drugs are safe and effective. “The FDA is an actual force for good and not just a bad news machine,” said Dr. Joshua Sharfstein, who served as second-in-command at the agency from 2009 to 2011 under President Obama. The strategy has also helped avoid any mistrust that might fester if the agency were to say too little. “The opaqueness of government creates mistrust, and people have a lot of interests in front of the FDA, and people have a lot of suspicions that they’re not getting heard, or they want to know whose voices are getting listened to,” Slavitt said. Indeed, while initial critics were worried that Gottlieb’s close relationships with pharmaceutical companies might impair his ability to effectively regulate them, the agency has been stepping up actions on some issues where the industry had previously largely set the rules. Gottlieb has directed the agency to do what it can to prevent the proliferation of prescription opioids, and urged a company to take a painkiller off the market because of the potential for abuse. The company, Endo Pharmaceuticals, complied with the agency’s request. Gottlieb has also made it clear that he considers drug pricing, typically outside the FDA’s purview, to be within its jurisdiction. “If consumers are priced out of the drugs they need, that’s a public health concern that FDA should address, within the scope of its mandate and authorities,” Gottlieb wrote in a blog post Monday. To that end, he issued guidance intended to make it easier for companies to market so-called “complex generics,” for which it’s logistically difficult to make a generic because the medication has so many different parts. Sharfstein noted that Gottlieb hasn’t yet faced a major crisis; he has put his good communication skills to use to showcase the agency’s successes, not to atone for its failures. Carome pointed to three drugs that have moved along the regulatory pipeline without, in his view, sufficient evidence. Among them was a blood thinner that didn’t meet the primary endpoint of its Phase 3 clinical trial. He also noted that, in July, the FDA decided a company developing a treatment for a rare disease no longer needed to run another clinical trial for the drug, after making that exact request a year before. Is he related to any of the other famous Gottliebs, the CIA’s Sidney Gottlieb or Jean Raymond Gottlieb? I was wondering the same thing. Let me know if you find out! I also might add that Dr. Gottlieb appears to have taken proactive measures to mitigate critical drug shorts and down time precipitated by the hurricanes that have devasted PR. He also seems to be explaining the potential consequences in a language that Pres. Trump understands. My only questions are whether or not FDA can afford to lose him to HHS right now and who would replace him if he becomes Secretary of HHS. It is good to see praise for Trump appointees coming from those who, for good reason, were suspicious of them. One is tempted to compare Trump to a stopped clock, mostly wrong but occasionally right. On the other hand, the appointment of Tom Price was like appointing Bernie Madoff to the Securities and Exchange Commission. The criticism of Gottlieb for going after the low hanging fruit seems odd. Where else are you going to start? That does not mean a person is necessarily ignoring longer term problems. Congratulations to Gottlieb for a good job so far and to Kolodny for publicly noting it.